M.Sc. Nursing College in Punjab – Why should you choose a nursing profession? What is the scope of M.Sc. nursing courses in Punjab, Mohali Chandigarh? All these questions will be answered here and now. In nursing, there is a very wide career scope and is a respectful job. For a bright future growth in this sector, you will need a good training and education in the field. Therefore, if you are looking for a best M.Sc. nursing college in Punjab region, Mata Sahib Kaur College of Nursing is the best option for you. We are one of the most trusted and preferred private nursing colleges in Chandigarh, Mohali, and Punjab. You can call nursing one of the noble profession in the world. The nursing profession has a very bright career option and demand as well. The one who is interested in serving mankind for the betterment of their health can surely join the nursing courses. M.Sc.Nursing is a postgraduate course in theories and principles of nursing and allied sciences. A candidate has to be a B.Sc. /B.Sc. (Hons) graduate in Nursing from a recognized university in order to be eligible for this course. The minimum education requirement shall be the passing of B.Sc Nursing / B.Sc Hons. Nursing / Post Basic B.Sc Nursing with the minimum of 55% aggregate marks. The candidate should have undergone in B.Sc Nursing / B.Sc Hons Nursing / Post Basic B.Sc Nursing in an Institution which is recognized by Indian Nursing Council. Minimum one year of work experience after Basic B.Sc Nursing. Minimum one year of work experience prior or after Post Basic B.Sc nursing. The candidate shall be medically fit. 5% relaxation of marks for SC/ST candidate may be given as per Indian Nursing Council. There are more than 200 profession options in the nursing field. Every nursing course and profession is having its own importance in its own way. There is always a strong reason for choosing a profession for you. Although the benefits are more in a government institute, there are very few government nursing colleges in Chandigarh. Even it is not easy to get the admission in these institutes. With a variety of options, nursing becomes the most preferred vocational field. And congratulations if you are choosing M. Sc. Nursing as a future career option. Because there are end number of benefits of choosing nursing as a professional course. Here are some of its benefits mentioned. It is the best noble profession you can go for. Because it helps you in nursing the people of all ages with the best care. Act as a mediator between the doctor and the patient. Makes you ready for the future working conditions. Training in the overall course will let you learn new things. Best career option with higher dignity and respect. It will also help you in making you ready for any situation like personal health issues. You will be able to take care of and treat yourself and the people around you. Higher salary packages for M.Sc. Nurses are there. Demand for more number of nurses worldwide. Self-satisfaction and realization is another one major benefit of the profession. The scope for nursing is very much wider than you think. Because you may only be acknowledged by a few prospective professions in nursing. The expectations for nurse demand are very high till 2020. While talking about the scope of M.Sc. nursing course, your only investment or cost incurred will be on getting the education and training in a nursing college. After that, you will only enjoy the returns in the field by offering your best services. What should you Choose Mata Sahib Kaur College of Nursing for M.Sc. Nursing Course? 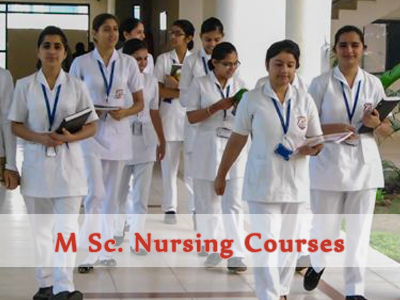 There is an end number of nursing colleges in the Punjab, Chandigarh and Mohali regions. But the growth and learning will only be there after making a right choice of nursing college. The degree is not only the single thing which will help you in earning high salaries. It is the skills and knowledge which will help you earn well. M.Sc. Nursing course duration is of 2 years. Quality education and practical training is the key feature of Mata Sahib Kaur College of Nursing. In the 2019 rankings of top M.Sc. nursing colleges in Chandigarh, Mohali, and Punjab you will find us easily. We train our students by keeping in mind the future demand of the responsibilities. Below listed are the characteristic features of MSKCN. Affordable and optimum fee structure. Skilled teaching and training staff. High future growth and career opportunities. Therefore, if you are interested in pursuing Nursing as a long-term profession then our services will surely work for your dreams. And aforementioned qualities are making us #1 M.Sc. nursing college in India in addition to being a top nursing institute in Chandigarh. So, go ahead and join the course right away to make a bright and shiny future.